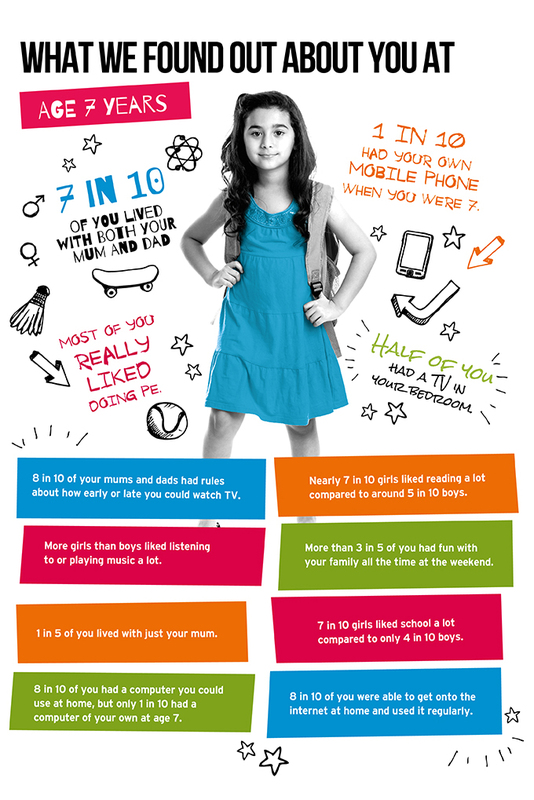 The Age 7 Survey took place in 2008, with 13,857 families and 14,042 children taking part. NatCen interviewers carried out the Age 7 Survey in England, Scotland and Wales, and the Northern Ireland Statistics and Research Agency (NISRA) carried out the survey in Northern Ireland. Most of you had been at school for two years by now and we were very keen to see how things had changed for you, how tall you had grown, and how many of your milk teeth had come out. You were starting to become more independent and to experience more of the world outside your home and family – becoming more involved with school, hobbies, sports and making close friends. You were old enough to tell us about all of these aspects of your own lives. The age 7 survey was special because we asked you to fill in a questionnaire of your own for the first time to see what you thought about different aspects of your lives. We asked you about your family, your friends, and how you like to spend your spare time. We also asked you how you felt about school, and how much you used the computers and computer games. You were weighed and measured again and you did some more activities with the interviewer including reading words, a maths activity and copying patterns again. At the age 7 interviews, we also asked if you would help in an extra part of the study, to measure children’s physical activity. We asked your parents if they would be happy to share one or more of your shed milk teeth with us. We also spoke to your parents about your family and home life, their work, your health and theirs, how you were getting on at school, and things that you did as a family. We also asked your parents if we could contact your class teacher to see how you were getting on at school. We asked your parents if we could add to the survey data, some information held by the National Health Service (NHS) about your health such as visits to the doctor or hospital, and information held by education departments about your education, such as exam results. At age 7, we collected some of your milk teeth for the ‘Every tooth tells a story’ project, to figure out how well children are being protected through different government measures to control lead. Lead is a hazardous chemical in the environment which can affect children’s learning, development and behaviour. Visit the FAQs section for more information about the ‘Every tooth tells a story’ project. Researchers have used Child of the New Century to learn more about a wide range of issues relating to school life, including achievement and bullying. Child of the New Century findings also show that only half of children are reaching the recommended daily minimum for moderate to vigorous physical activity. At age 7, we collected some of your milk teeth for the ‘Every tooth tells a story’ project, to figure out how well children are being protected through different government measures to control lead. Lead is a hazardous chemical in the environment which can affect children’s learning, development and behaviour. Visit the FAQs section for more information about the 'Every tooth tells a story' project.